Take your smoothies, sauces, and more, to the next level with Gandalf Spirulina™, nature’s original superfood. What do you get when you combine one of the planet’s oldest living organisms, the power of the sun and an unmatched dedication to purity? Gandalf Spirulina™, nature’s original superfood. Adding it into the culinary mix puts a long list of nutritional benefits at your fingertips. Rich in beta carotene, nutrients, vitamins, and minerals, Spirulina has existed for more than three billion years. 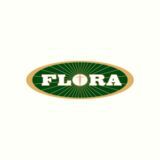 In fact, it’s one of the oldest living organisms on earth, and considered by some, to be nature’s original superfood. This blue-green algae helps maintain eyesight, skin, membranes and immune function, and helps in the development and maintenance of bones, teeth and night vision. It also helps with the formation and proper function of red blood cells, while building and repairing body tissues, contributing to the overall maintenance of good health. Gandalf Spirulina™ is unique in that it’s harvested and dried through a unique process called Ocean Chill™, which removes oxygen to protect beta carotene from oxidizing, preserving its purity and integrity. It comes to you as nature intended. 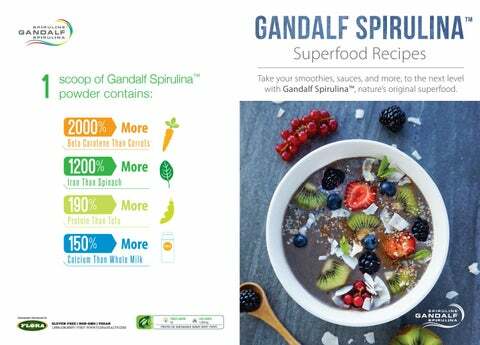 Armed with this knowledge, blending in some imagination, and of course a dash or two of Gandalf Spirulina™, we’ve put together some simple and delicious recipes to inspire your creativity, and get you started with Gandalf Spirulina™. Tropical fruit smoothie Start your day oﬀ right with a sweet and sunshiny smoothie. The Tropical Fruit Smoothie brings together bursts of bright fruit flavours with creamy yogurt and power-packed Gandalf Spirulina™, for a delicious blend that’ll leave your whole family smiling. Yogurt brings protein and probiotics to the mix, while the addition of tropical fruit helps you load up on vitamin C, ideal to keep your immune system strong. Gandalf Spirulina™ is the icing on the nutritional cake, upping the ante on this refreshing and nutritious blended bevvie that’ll fuel your morning, and beyond. Key Lime Pie Smoothie Pie for breakfast? Yes, you heard us right. Our Key Lime Pie Smoothie hits the health mark and makes a great breakfast option, yet is delicious enough to tempt even the toughest critic. Lime juice delivers a boost of vitamin C, apple brings a solid dose of fibre to the table, and coconut flakes add a hint of tropical flair. Add this easy-to-make smoothie to your weekend breakfast spread, or throw it together in a pinch on busy weekday mornings, for a nutritious and delicious breakfast that’s sure to surprise and delight. Blend all ingredients together until smooth. Garnish with extra coconut. Make this recipe Insta-worthy and include sliced bananas for tropical flair! papayalicious smoothie With a base of sweet, luscious papaya, this easy-to-make smoothie is true to its name. The Papayalicious smoothie helps this tropical fruit shine, together with your favourite fruit juice, creamy and perfectly tart yogurt, and a hint of natural sweetness. In addition to their distinctive, sweet taste, papayas are rich in vitamin A, plus they bring an especially potent form of beta-carotene to the table - a great addition for healthy skin and eyes. So mix up, drink up and soak up the benefits of this flavourful tropical fruit - your body, taste buds, family and friends will thank you. Clean and peel the papaya, cut in two and remove seeds. Garnish with chopped figs for additional sweetness. Gandalf peppermint ice tea Hot summer days call for a fresh and hydrating glass of something special. What better way to toast good times, good friends and good health than by raising a glass of refreshing and easy-to-prepare Gandalf Peppermint Iced Tea, with a healthful twist. Made with caﬀeine-free Peppermint Tea, embraced in traditional medicine to soothe the body and lift the spirits, and with the added flavour of tangy lemons, refreshing mint, and a dash of power-packed Gandalf Spirulina™, this delicious drink quenches your thirst! Place 1 tsp of Gandalf Spirulina™ powder into a cup and add 250 ml of warm water. Mix together. In a separate pitcher, add 1 ½ liters of boiling water to eight natural peppermint tea bags. Steep for five minutes. Allow to cool, add Gandalf Spirulina™ mixture, and chill with ice. Spirulina Guaca-mole-mole Guac lovers, rejoice! Your favourite party snack just got even better. Adding tomatoes and onions to creamy avocados, high in fibre and potassium, among other nutrients, adds great texture and zest to this popular dish, but what sets the Spirulina Guaca-Mole-Mole apart is the addition of Gandalf Spirulina™ powder, turning this dip into a healthy, green, superfood nutrient delivery machine. Holy, Guacamole! Mash the avocados. Add all other ingredients and blend well. Serve with veggies or corn chips. Pesto à la Gandalf for Pasta Salad Love pesto? Then you’ll love our Pesto à la Gandalf, perfect to top pasta or potato salad, or serve as a spread, at your next potluck. The vibrant flavour and colour of Gandalf Spirulina™ lends itself perfectly to pesto, adding a hint of health to this simple, delicious and classic Italian sauce. Place all ingredients in a food processor except the olive oil. Blend and SLOWLY add olive oil until consistency is smooth. Serve as a pasta sauce, pasta salad, or as a spread. Gandalf Spirulina™ Fruit Parfait Looking for a delicious, new good-for-you treat to add to your culinary arsenal? Our Gandalf Spirulina™ Fruit Parfait ticks all the boxes, and is loaded with protein and nutrients to boot. Combining layers of creamy yogurt, great for bone health and digestive well-being, your favourite fresh fruit and the hearty and delicious crunch of chopped nuts, plus a sprinkling of Gandalf Spirulina™ powder, this palatepleasing parfait is a totally customizable combo that can be whipped up in minutes, while its benefits can help carry you through the day, and beyond. Layer the 1/3 of the yogurt, 1/3 of the mix fruit, 1/3 of the nuts and sprinkle 1/3 the Gandalf Spirulina™ powder. Repeat 2 more times in a tall parfait glass. Finish with a sprinkle of Gandalf Spirulina™ powder. A Very Berrylicious Spirulina smoothie Start your day oﬀ on the right foot with this bright and sunny vegan smoothie that will help provide you with the fuel you need to make the most out of your day. The blend of almond milk and banana provides a delicious, creamy base that’ll make you think you’re sipping something decidedly less healthy (don’t be fooled - it really is that good for you!). Add in your favourite frozen berries and a couple teaspoons of Gandalf Spirulina™ powder, and you’ve got yourself a berry delicious smoothie! Top your smoothie with unsweetened shredded coconut. The workout smoothie bowl A solid workout deserves an equally solid reward. Treat yourself, while treating your body to the nutrients it craves post-workout, with The Workout Smoothie, great as is, or as a base for a smoothie bowl. Frozen banana and strawberries come together with protein powder and nutrient-packed Gandalf Spirulinaâ&#x201E;˘ to form a deliciously dense smoothie base. Sip away at this tasty blend as-is, or pour it into a bowl and top with your favourite fruit and nuts for a next-level smoothie bowl version. Pour in a bowl and kick start your day with a protein packed smoothie bowl. Garnish with slices of fruit and shaved coconut. Spirulina Verte Lemonade Some days, nothing will fit the bill and quench your thirst quite like a refreshing, cold glass of lemonade. We’ve put a nourishing twist on this classic by adding a dash of Gandalf Spirulina™ powder. The result? A dark, delicious and nutrient-dense lemonade that’ll tantalize your tastebuds, satisfy your thirst, and give your body a healthful boost. Combine the first three ingredients together. Mix Gandalf Spirulina™ powder into the lemonade, stir and serve over ice. Serve with our Spirulina Guaca-Mole-Mole at your next social gathering. It's sure to be a healthy hit!